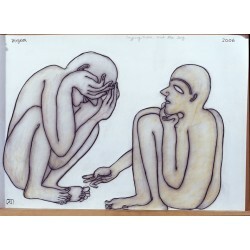 Jogen Chowdhury, a.k.a ‘the master of the unbroken line’, was born in 1939 in Faridpur, Bangladesh. He studied at the Government College of Art and Crafts in Kolkata and the Studio of Academy of Fine Arts in Kolkata, gaining a scholarship to attend the Ecole Nationale, Superieure des Beaux-Arts in Paris. 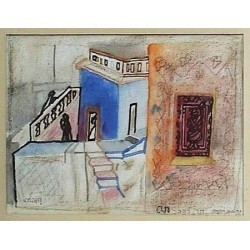 One of his early influences was his parents who were involved in art – his mother drew, while his father had an interest in painting and sculpting. Jogen has been involved in several solo and group exhibitions over the years – in India and abroad - including ‘Inverting Inventing Traditions’ at Grosvenor Vadehra in London, an Autumn Exhibition of Contemporary Indian Art at the All India Fine Arts and Crafts Society (AIFACS) in New Delhi, the Gallerie Foundation for Indian Artists in Amsterdam; and more recently, ‘Freedom 2008 – Sixty Years after Indian Independence’ at the Centre for International Modern Art (CIMA) in Kolkata. 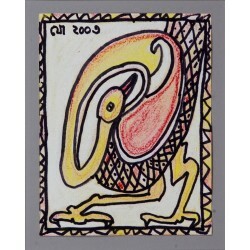 He resides (and works) in Santiniketan, West Bengal.